The Redwood Song was written in 1960. It was scored and sung by two men who were working at KINS 980 – Ron Walters and founder of Eureka Broadcasting, Wendell Adams. The reason for creating this was to pay homage to the breathtakingly beautiful area we call home on the scenic coastline. Mr. Adams was a professional jingle writer working for William Estes and J Walter Thompson during his career on Madison Avenue in New York. His most recognized jingle was the Winston cigarette jingle (Winston tastes good like a cigarette should …). Mr. Walters left the company in the mid-1960s and helped to develop the Radio/Journalism program at the (then) newly formed Sonoma State University. The instrument played is a ukalale and features Mr. Adams talents. The vocal work is done by Mr. Walters. 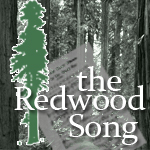 The Redwood Song airs on each of the Eureka Broadcasting Company radio stations between 5:45a and 6:00a each morning. Download lyrics and music below. So HE made a Redwood Tree. The silver sea gulls soar. For the land he gave to me. I see my Master’s hand.